The general aim of the workshop is to improve the lives of adult learners, especially those belonging to social and economic disadvantaged groups that are affected also by literacy issues; the main leverage in doing that is to provide a platform of relating and supporting them in deconstructing self-limiting and self-defeating descriptions of self (problem saturated stories about themselves) and in developing the agency to embrace further adult education. The practical way to reach this overall goal is to invite to the interactive workshop adult educators (teachers, coaches, and counsellors, other professionals) to exercise narrative and dialogical open ways of positioning and relating. Narrative approaches and open dialogues are practical approaches that have roots in different geographical source – Australia for narrative approaches and Northern Europe for open dialogues – but they are recently connected in emphasizing the disconnecting processes that abound in professional services and in human connections without reflective surfaces and practices. Some of the narrative approach and dialogical practices will be provided as narrative competencies to the participants especially linked to the relationship with the literacy issues. From a functional literacy perspective the innovative aspect of the workshops relates to its focus on dialogue systems and interactive conversations related to literacy. Literacy is “a life skill and the primary learning tool for personal and community development and self-sufficiency . . . . Literacy is now seen as the foundation for life skills ranging from basic oral and written communication to the ability to solve complex scientific and social problems . . . . The new definition makes it clear that literacy is the primary enabling force for all further education. It is a uniquely effective tool for further learning for accessing and processing information, for creating new knowledge, and for participating in one’s own culture and the emerging world culture.” (Inter-agency Commission, 1989). From this very broad perspective, narrative and open dialogue approaches are tackling the very core of personal expression an identity-development and re-engagement with life. 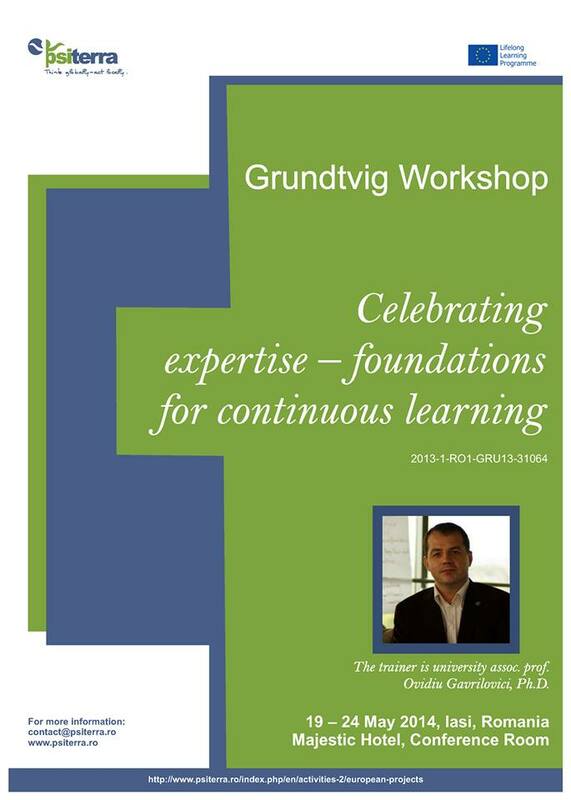  the development of a practice of continuous reflection that will continue at home on personal and professional development to support adaptation of working with adults with literacy issues in connection to colleagues from other European regions/countries. The trainer that will be running this course is university assoc. prof. Ovidiu Gavrilovici, Ph.D. The program will provide insurance, local transportation, accommodation and meals during the workshop; the airfare will be reimbursed (up to 340 EUR) after all the proofs (ticket, boarding passes) will be mailed in original to the organizers. If you are interested in participating, please fill in the application form. This form and your CV should be sent until February 15, 2014 to the following address: aliona.dronic@yahoo.com (Aliona Dronic is the program coordinator).